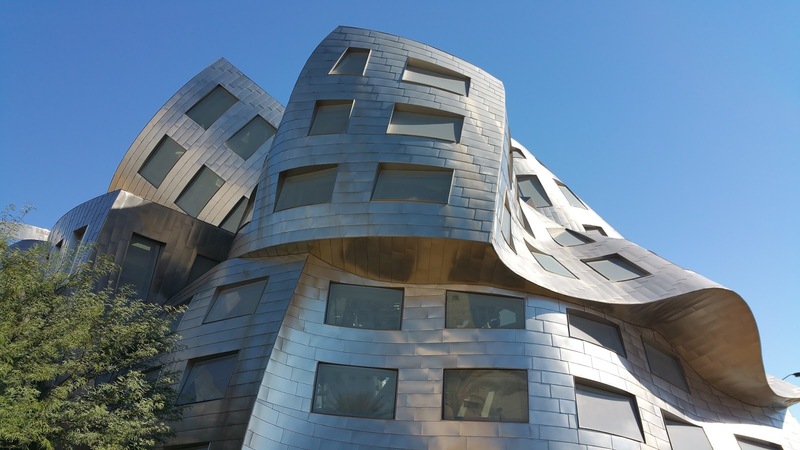 The Lou Ruvo Brain Injury Center. So much irony here. The top-secret Janet Airlines flies out of Vegas. This is the most comprehensive Las Vegas weather site I've ever seen. We have a ghost town...under Lake Mead. We also have a haunted pet cemetery in Boulder City. A ways away from Las Vegas you will find Nevada's only micronation, Molossia. Las Vegas has a super secret, by-appointment-only art exhibit at City Center. The Wheel of Misfortune used to be an urban legend but now it is a quirky tourist attraction. My favorite TV show about Nevada is 'Outdoor Nevada'. People really do live under the city in storm drains. We have an observatory but it is off limits to all but LVAS members. When you go to Spring Mountain Ranch State Park, ask to see the secret room. You can see a piece of the Berlin wall, in the men's restroom at the Main Street Station Casino. Find a bird sanctuary right on the Las Vegas Strip (it's out the back door at the Flamingo Hotel). The secret pizza place at the Cosmo used to be a secret, now not so much. You can pray for your immortal soul, go to confession, and take communion right on the Las Vegas Strip at the Guardian Angel Catholic Church. You can get a custom coffin made in--where else--Coffinwood just down the road in Pahrump. The closest legal brothel to Las Vegas features a hotel and restaurant (you don't have to partake of their other services). Find Devil's Hole just outside of Las Vegas at Ash Meadows. Machine guns are outlawed nearly everywhere but not in Nevada. There are several places to shoot machine guns in Las Vegas. You can walk out over the Grand Canyon on a glass skywalk (eekk!). Want to do a marathon in Nevada in August? Run the ET Full Moon Marathon! If you are looking for weird people, the Fremont Experience on a weekend night has more weird people per square mile than anywhere else in Vegas. For pure creepiness factor, the Madame Tussaud's Wax Museum was pretty weird. The High Roller at the Linq is pretty cool--it is the largest observation wheel in the world. One would expect the Bodies Exhibit to be creepy but it is actually fascinating and very educational. There are several TV shows filmed in Las Vegas (American Ninja and Penn and Teller Fool Us to name a couple). Find audience tickets to these shows here. While Cirque du Soleil tickets are much in demand (and pretty expensive) the public can watch their rehearsals for free! Take a ride on the new driverless shuttle in downtown Las Vegas! Seven Magic Mountains is...unusual. A huge pile of painted rocks in the desert that draws visitors from all over. Although I've never been, apparently it is possible to do a ride along with Las Vegas Metro, one of the busiest police departments in the country. Las Vegas has a very active walking group and everyone is invited to tag along with them. I haven't been to Blackout Dining in the Dark either but the thought of eating an entire meal in the dark is just...weird. Click here for the next part of the list.